Posted on Thu, Mar 29, 2012 : 3:56 p.m. Forward Chris Brown will forgo his senior season with the Michigan hockey team. The Wolverines' fifth-leading scorer singed a three-year, NHL entry-level contract with the Phoenix Coyotes on Thursday. Though it is not official yet, Brown will likely finish out the season with the Coyotes' American Hockey League affiliate Portland Pirates, according to a team spokesman. 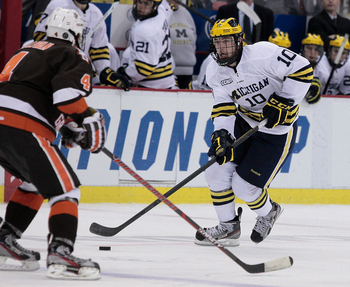 Michigan forward Chris Brown (10) signed a three-year, NHL entry-level contract with the Phoenix Coyotes. "I want to thank the Michigan coaching staff, my teammates and all the fans who have made my three years in Ann Arbor an experience that I will cherish forever," Brown said in a statement on Thursday. "This was a very difficult decision for me to make, but at the same time I am excited about this opportunity." Michigan coach Red Berenson did not agree with Brown's decision. “We are disappointed in Chris’ decision to leave Michigan and not graduate with his class,” Berenson said in a statement. Brown, a Flower Mound, Texas native, was the Coyotes' second-round draft pick (36th overall) in the 2009 NHL draft. Before playing at Michigan, Brown played for the Detroit-based Honey Baked club hockey team, for two years with the United States National Team Development Program and graduated from Pioneer High School. "It was a pretty difficult decision to make because I love Ann Arbor and love Michigan. It's been a second home." Brown said in a phone interview. "I felt the timing was right for me and my family." The 6-2, 207-pound forward had 29 points (12 goals, 17 assists) in 38 games for the Wolverines this season. He was named All-CCHA honorable mention and recognized for the CCHA Play of the Year (see below) for his goal against Miami on Feb. 4. In his career, Brown appeared in 125 career games with 80 points (34 goals, 46 assists). On Monday Berenson said he thought the senior year was essential to players for a multitude of reasons. "Playing your senior year, look what it did for Steven Kampfer, look what it did for Matt Hunwick, look what it did for Carl Hagelin. I mean these guys are good examples of doing the right thing and how they grew in their senior year in that leadership role," Berenson said. "What about graduation? Why did you come to school to start with? Was it just to play hockey? If you did, you came to the wrong place. We graduate players here." Brown said the decision didn't weigh on him during the season, stating "when I was wearing that Michigan jersey, I was focused on Michigan." He said it was very difficult for him to tell Berenson he would not be returning. "It was very hard to tell a man that gave me an an opportunity for a great education that I'd be leaving early," said Brown. "Obviously, he’s going to be disappointed, he’s got a team to look out for, but at the same time he gave me his blessing. He shook my hand and wished me good luck, which meant a lot." Brown said he will finish the semester before likely reporting to Portland for the remainder of the AHL season. He will join the Coyotes at training camp over the summer. Brown is the fourth Michigan player this week to turn pro. David Wohlberg signed an amateur tryout contract (ATO) to play with the Albany Devils on Monday, with the expectation that he will sign with the New Jersey Devils over the summer. Greg Pateryn signed a two-year deal with the Montreal Canadiens on Wednesday and Shawn Hunwick signed an ATO with the Columbus Blue Jackets on Wednesday, before eventually signing a deal for the remainder of the season. Brown is the only underclassmen of the four. Pete Cunningham covers sports for AnnArbor.com. He can be reached at 734-623-2561, by email at petercunningham@annarbor.com and followed on Twitter @petcunningham. Fri, Mar 30, 2012 : 4:46 p.m.
C'mon, it's not like he's leaving after his freshman year - he gave us 3 good seasons and is going to Pheonix's top affiliate for crying out loud. If they didn't have a roster spot for him, of course he would've stayed his final year. Is it possible Kampfer, Hunwick and Hagelin didn't have the opportunity Brown does following their junior year? What kind of message is this: don't come to school here if you harbor any aspirations to play in the pros prior to graduation. If you have players that leave early for good opportunities, you're doing something right with them coach. Fri, Mar 30, 2012 : 12:23 p.m.
Is it just me or do you get the feeling that one person is telling these Michigan players, whether its Brown, Morris, or Warren, that they should go pro when they are not ready! I can not tell you how important it is to grow physically and mentally that extra one or two years at the college level unless you are a sidney crosby, Ken Griffey Jr., or Charles Woodson. So for Brown it is unclear if he will ever play in the NHL and he does not have a degree if the worst happens! Brown should have asked Donovan Warren about leaving early! Go Blue!! !